Origami is the Japanese art of folding paper to create different shapes and figures. My students have thoroughly enjoyed creating while following directions. In this product, you will receive detailed written and pictured instructions on how to fold a 6 by 6-inch paper to create a Bookmark Origami. The various forms of instructions are given to help you differentiate between your student’s various learning styles. You will also receive a preprinted template that will guide your students through the folding process. This template will greatly help those students that have never tried origami folding before. I have noticed that after several origami projects, my students tend to follow daily instructions better and are more careful to read written instructions on homework and test. 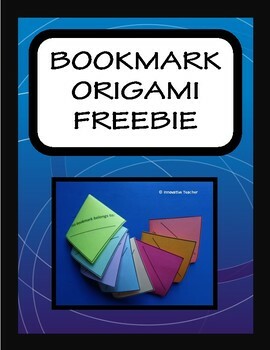 Bookmark Origami FREEBIE by Innovative Teacher is licensed and cannot be distributed/shared without the purchase of an additional license.